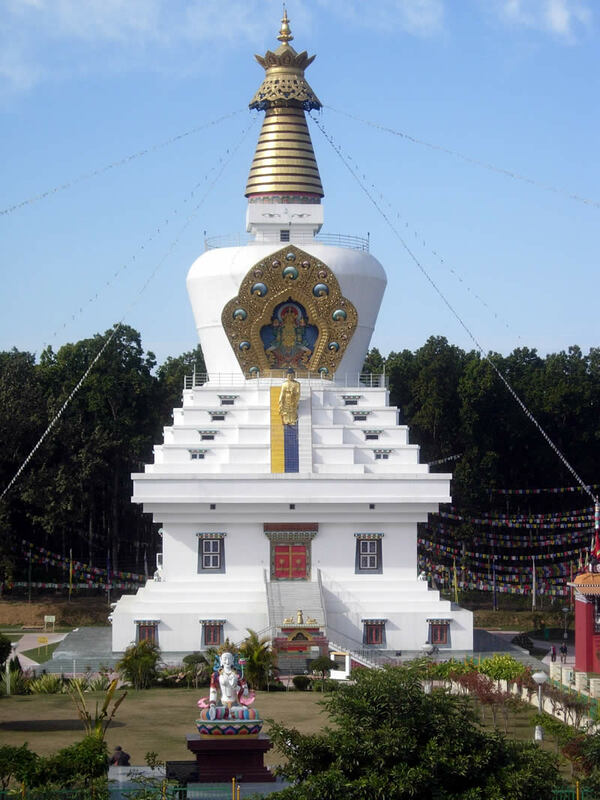 The Great Peace Stupa in Og Min Ogyen Mindrolling Monastery in Dehradun, India, is 185 feet tall and 100 square feet in width. It is the world’s largest stupa and is a magnificent example of buddhist art and architecture. The stupa is surrounded by a two-acre landscaped garden. On the facade of the stupa, Maitreya, the future Buddha, has been beautifully painted. Descending the steps is the present Buddha, the Buddha Shakyamuni. On the several floors inside the stupa are shrine rooms with elaborate murals executed in the finest tradition of Tibetan Buddhist art. Sacred relics have also been placed in the stupa. The facade of the stupa is decorated with a beautifully painted mural of Maitreya, the future Buddha. Maitreya, it is said, will be reborn in a period of decline to renew the doctrine of the founder of Buddhism, the Buddha Shakyamuni. Maitreya is believed to be a bodhisattva, one who refuses entry into nirvana, a transcendent state free from suffering, out of a compassionate desire to help others. At present, he is believed to reside in Tushita Heaven, where he awaits his rebirth. Descending the steps is the present Buddha, Buddha Shakyamuni. Other shrine rooms within the stupa include the Shakyamuni Buddha shrine room, the Padmasambhava shrine room depicting the eight manifestations and twenty-five disciples of Guru Padmasambhava, and the Four Immeasurables shrine room (Mindrolling Lineage shrine room) with statues of all the Trichens and Khenchens throughout the history of Mindrolling up to the present day. Within the stupa are relics of Buddha Kashyapa, relics from Guru Padmasambhava’s tooth offered by Nyenchen Thanglha and so forth. All acquirable sacred substances which liberate through taste such as the relics of the body of reality, relics of various nirmanakaya manifestations, relics of raiment, relics of five kinds, and so on, all with the attribute of having passed down through genuine spiritual beings, indisputably renowned as authentic, are also placed within the stupa. In addition, whatever self-arisen representations and undoubtedly wondrous sacred substances that could be acquired are placed in this stupa. A stupa is a Buddhist monument representing the Buddha’s enlightened mind. It is essentially the earliest form of the Buddha’s image built in order to commemorate the major events in his life and to mark the sacred places where these events occurred, and to house his relics as well of those of his spiritually accomplished disciples. As the receptacle of the Buddha’s enlightened mind, a stupa encapsulates a multitude of symbolic meanings that reveal his enlightened qualities. A stupa is said to bring great benefit to the land and immense blessings to anyone who beholds it. The Stupa of Descent from Devaloka at Mindrolling commemorates Buddha’s descent from the heaven of the thirty-three Gods (Trayastrimsa) when he was forty-two years old. Here he spent the summer retreat in Tushita heaven teaching the dharma to the reincarnation of his mother, in order to repay her kindness in having borne him just before she died. He descended in the city of Sankasya, and the local inhabitants there built a stupa in this design to commemorate the event. The stupa’s foundation was laid down on the 29th of April, 2000 and construction began in earnest on the 23rd of December the same year. This ambitious project was undertaken under the leadership of His Holiness Mindrolling Trichen and expert guidance on every aspect of the stupa by His Eminence Khochhen Rinpoche. All the expenses for the stupa were provided by the Venerable Ti Ching. The Great Stupa of Descent from Devaloka which Liberates Upon Seeing was inaugurated on 28th of October, 2002. The date of 28th of October, 2002 was chosen because it was the day of Buddha’s descent from Trayastrimsa. The Rinpoches of Mindrolling determined this blessed day as highly auspicious for the inauguration of the stupa. The consecration ritual and inauguration ceremony was performed in the presence of the supreme guide of peace in the world, His Holiness the 14th Dalai Lama. Constructed to benefit all beings and dedicated to world peace, the Great Stupa was inaugurated on 28th of October, 2002.